A cute little brother-type character who adores Akira. He entered the eyeglasses club because he wanted to help his beloved upperclassman. Due to his extreme amount of respect, he sometimes has a split personality. He works very hard because he wants Akira to rely on him. 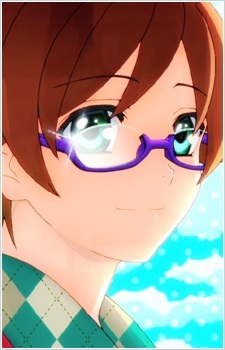 When he first entered the school, he had uncool glasses, but he bought his new glasses with Akira. His favorite type of glasses is under-rim cel frames, and his vision is 0.08 in his left eye, and 0.4 in his right. He has a certain dislike for Hayato due to the fact that he has normal eyesight and sees him more as an annoyance to the club, that he would pick on him by playing rough jokes.